Missing teeth can cause even the most confident people to second guess their smiles — and themselves. 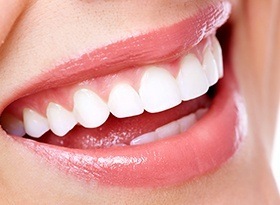 Covina Family Dental can provide patients that have missing teeth and noticeable gaps in their mouths with fixed dental bridges in Covina, CA. Contact us today to schedule a visit with Dr. Tran! Bridges are designed to literally “bridge” the gap left by missing teeth. Natural teeth on both sides of the gap are then used as “anchors” that keep the bridge securely in place. If there are no healthy teeth available to serve as these anchors, dental implants may be an excellent alternative. When Dr. Tran is ready to anchor your new fixed bridge in place, the neighboring teeth will be gradually shaved down enough to accommodate the placement of dental crowns over them. Then, the pontic (false tooth/teeth) is bonded to these crowns, creating a reliable and functional result. Despite its name, fixed dental bridges shouldn’t actually be considered permanent. They are likely to require replacement every 7-15 years on average, depending on the patient’s specific oral health situation and how well they care for it in day-to-day life. Traditional bridges – When you have healthy teeth on either side of the missing tooth/teeth, a traditional bridge can be successfully inserted. They are typically compromised of dental porcelain that’s been fused to metal or ceramics. Cantilever bridges – If the patient only has a healthy tooth on one side of the gap, a cantilever bridge is the best option available. This type is bridge is typically only recommended for visible front teeth, as the patient cannot place too much pressure on them over time if they’re to remain functional. Resin-bonded bridges – Resin-bonded bridges are also sometimes referred to as Maryland bridges. They are crafted from plastic “teeth” and gums, as well as a durable metal foundation that supports them. The foundation is securely bonded in place to the back sides of existing teeth. Thus, they do not require as much preparation as cantilever and traditional bridges. Resin-bonded bridges are, on average, less expensive than the alternatives, but they cannot be bonded to teeth that contain fillings or in the back of the mouth, as there is too much pressure. What Should I Expect When Getting a New Dental Bridge? Patients can expect to visit our practice for a few different appointments when pursuing a new, custom-made dental bridge. During the first visit, you can expect Dr. Tran to prepare the abutment teeth (the teeth on either side of the gap) by filing down the natural enamel. Both of these teeth will then be covered by temporary dental crowns. Once this step is complete, it will be time to create detailed impressions of the patient’s teeth. Our chosen dental laboratory will use this information to make the high-quality bridge, pontic, and crowns. While we’re waiting on the laboratory to finish this process, Dr. Tran will supply patients with a temporary bridge as well so that they can enjoy their smile’s full function and get used to the restoration. At the next appointment, the temporary bridge will be removed and the permanent bridge will be inserted in its place. Any adjustments will be made as needed, and Dr. Tran may only temporarily cement the bridge so that we can be sure that you, the patient, is fully satisfied with its appearance, durability, and overall feel. Our team will also want to see you for one or more follow-up visits so that we can make sure your newly completed smile is as effective as possible. Finally, the bridge will be permanently cemented in place. Am I the Right Candidate for a Dental Bridge? During an initial consultation, Dr. Tran can determine whether dental bridges are the right fit for your specific needs and preferences. How Do I Care For My Dental Bridge at Home? Once your bridge is permanently affixed in place, eating should be much easier! However, we do strongly suggest that you eat soft, cut-up foods at first while you get used to the mouth feel of the restoration. It is absolutely critical that patients with bridges maintain the health of their remaining natural teeth. The neighboring “anchored” teeth are the foundation of your new replacement and will ensure its long-term success. Please plan to brush and floss regularly while also scheduling checkups and cleanings here at Covina Family Dental every six months. Eat a well-balanced diet and limit your exposure to overly sugary foods that will gradually eat away at natural enamel. If you need a little extra help figuring out the best ways to brush and floss at home, let our team know! We’d love to demonstrate them for you.